Keep the Blue Ridge Energy outage reporting number handy this weekend! 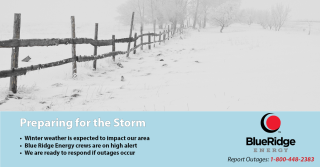 Blue Ridge Energy crews are on high alert and are monitoring potential impacts from the winter storm that is expected to impact the region this weekend. Line technicians are prepping trucks with all necessary supplies and materials for any outages that may occur as a result of the storm. System operators monitor the Blue Ridge power system and weather on a daily, 24-hour basis and all other employees are on high alert, ready to respond to member needs, including the cooperative’s member/customer service contact center. Blue Ridge Energy urges members to act now to make preparations to remain safe and comfortable in the event of an outage. While specific precipitation types and amounts continue to be fine-tuned, forecasts indicate that our service area may be heavily impacted by the storm. • Assemble an emergency kit. It should include at least a three-day supply of water, non-perishable food, medication, first aid supplies, a flashlight, weather radio and extra batteries. Include a list of emergency contacts. • Charge your cell phone and have external, backup power sources charged. • Stay tuned to local forecasts. • Fuel up. Fill up your vehicles before the storm as a loss of power could put affect gas stations. • Consider having supplies handy for your propane or charcoal grill. Be sure to grill outdoors in well ventilated areas for safety. • Gather supplies in case you need to stay home for several days without power. Keep in mind each person’s specific needs, including medication. Do not forget the needs of pets. Have extra batteries for radios and flashlights. Keep the Blue Ridge Energy outage reporting number handy: 1-800-448-2383. Members can also report outages on the Blue Ridge Energy mobile app, available for free on app stores.